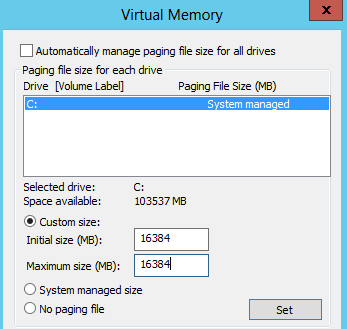 This post is part of a series of posts aimed at creating and managing a Hyper-V Cluster. This part will deal with the initial installation as well as a part of the configuration. As a best practice, Microsoft recommends that Hyper-V be deployed on Windows Server Core to minimize overhead and reduce the attack surface. Starting with Server 2012, the GUI can be removed or installed on demand. This part of the guide aims to be on the easy side, as such, we will start with the GUI installed for the initial configuration and remove it later on. An advanced guide using Server Core directly from the start with appropriate PowerShell commands will follow later on. This guide assumes that you have already checked your various hardware components as being certified to run Microsoft Failover clusters. Some examples to check could be the SAN firmware, fiber switches, fiber HBAs, latest certified BIOS/UEFI, NICs firmware, device drivers, SAN compatibility with ODX, etc. Verify this information with your vendors. For starting setup, it is recommend to boot the server you are preparing with the vendor’s latest bootable discs such IBM ServerGuide or HP SmartStart or other depending on your hardware vendor. They will contain the latest drivers for your particular hardware. Disable RDP Printer redirection: This can be configured either locally via GPEdit or deployed to all the Hyper-V Cluster nodes with a GPO. The option can be found at Computer Configuration –> Policies –> Administrative Templates –> Windows Components –> Remote Desktop Services –> Remote Desktop Session Host –> Printer Redirection –> Do not allow client printer redirection. Set this option to Enabled. Restrict Paging File: Windows dynamically adjusts paging file by default and is partly based on the installed physical RAM. High end Hyper-V Cluster nodes will usually have several hundred GBs of installed memory. Limit the paging file size to a fixed size of 16GB or 32GB. Don’t forget to click Set at the end. This is the bare minimum. If iSCSI is not used, the number goes down to 5. Nevertheless, Hyper-V is very flexible in this aspect and a Hyper-V cluster node can be ran on a single NIC if desired though this setup is highly not recommended. Live Migration: This will handle Live Migration traffic when VMs are moved from one host to the other. Microsoft recommends that Live Migration has its own dedicated NIC. 10 Gbps is recommended. VM Network: This will handle the traffic for the virtual machines via Virtual Switches. Depending on the workload and interface speed, more than one NIC will be needed. I would recommend a minimum of two NICs teamed for throughput and failover purposes. As above, the recommendation is that this functionality has it own NIC(s). Management: All management tasks will be performed over this interface such as Hyper-V Manager, VMM agent connectivity, Failover Cluster Management, etc. Parent partition management will also pass through this interface. 1 Gbps should be enough, teaming is preferred. CSV: Redirected I/O traffic will pass through this interface. In normal conditions, this interface will remain idle and all I/O should be in direct mode. Redirected I/O occurs when a host’s direct connectivity to the storage fails or a CSV is placed in Backup mode. Another less known fact is that redirected I/O also occurs when a VM’s dynamic VHD needs to be expanded and the node currently hosting the VM is not the owner of the CSV where the VHD is stored. A dedicated 10 Gbps NIC is recommended. Heartbeat: Cluster heartbeats will be sent over this interface. A dedicated NIC is recommended though the trend recently has been to include this functionality with the management interface. iSCSI: If iSCSI will be used, this is the interface that will handle the IP storage traffic. Again, the recommendation is dedicated NICs for this connectivity. A minimum of two NICs in MPIO mode over redundant paths is recommended. While supported, NIC teaming should be avoided for iSCSI. Consult your storage vendor for additional best practices specific to your hardware. The trend is all about converged infrastructure these days where the physical interface for storage and network is combined. I will stick with the traditional approach for this guide and will discuss converged infrastructures in a later article. 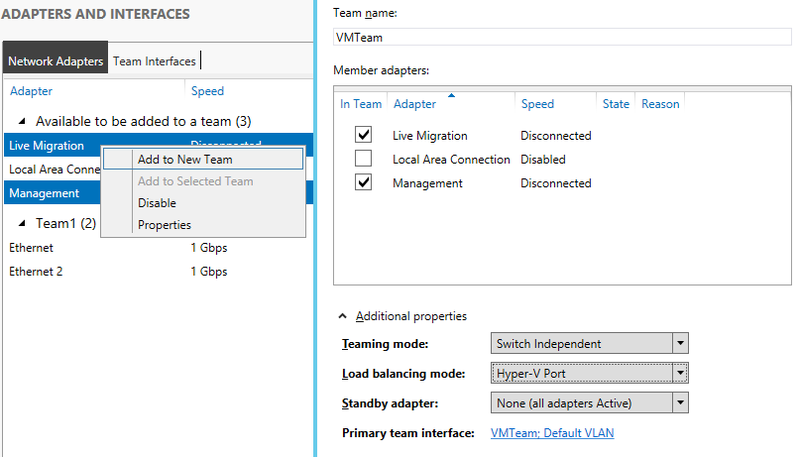 Also to note that if teaming will be used, teams needs to be created before installing and configuring the Hyper-V role. Also note that teaming disables the NIC’s RDMA capability. For the purpose of this guide, fiber channel for storage and four NICs for connectivity will be used. Additional configuration will need to be done to the network interfaces once the Hyper-V cluster is up and running. In this mode, Hyper-V will load balance the traffic between the two physical interfaces based on the VM’s MAC. Preferably, connect each NIC to a different physical switch for fault tolerance. Switch ports should be trunk ports and Hyper-V will tag packets with the appropriately configured VLAN. Note that some switches support switch stacking which combines several physical switches into one logical switch. This allows you to use one of the Switch Dependent modes (Static Team or LACP) on two separate physical paths, giving you fault tolerance as well as link aggregation. Discuss this with your network administrator. Live Migration/CSV: Starting with Windows 2012 and SMB 3.0, CSV traffic uses SMB Multichannel. 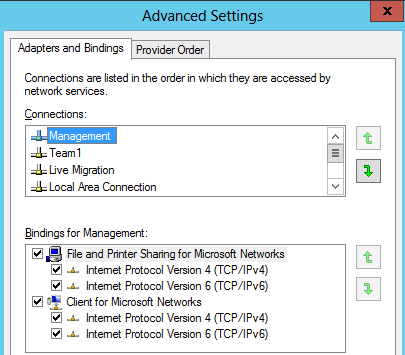 Live Migration also uses SMB Multichannel starting with Server 2012 R2. This leverages multiple interfaces for speed and resiliency. It can also give performance improvements in single NIC scenarios. Unlike teaming, RSS and RDMA can still be used if supported by the NIC. Dedicating one NIC for CSV and one for Live Migration, in combination with SMB multichannel and Live Migration capping will provide fault tolerance and link aggregation for the traffic. More on that in a later article. For now, let’s cap Live Migration traffic to avoid saturating the link. We will combine Live Migration with CSV functionality for this guide. Since we are using just one NIC for this functionality, complete high availability is reduced. This is a Microsoft supported scenario though. If the cmdlet is not available, install SMB Bandwidth Limit feature from Server Manager. For Hyper-V Clusters running on older versions of Windows Server, QoS policies can be used to achieve throttling as discussed here. Set an appropriate IP address for the interface. Rename it to a more descriptive name. DNS, gateway and DNS dynamic registration should not be set. That’s it for this part. In the next part, I will finish the configuration and install the required roles and features. Following that, we will create and configure the Hyper-V Cluster. 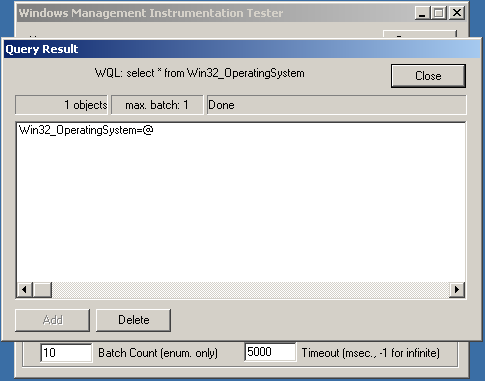 Win32_OperatingSystem is a WMI class and this indicated that WMI was acting up on the target PCs. Nevertheless, we attempted to install the client locally on one of the problematic PCs by copying the client installation folder and running ccmsetup.exe with SMSSITECODE=<code> option. The query failed with Invalid Class error. We used PSExec to run the script remotely on the remaining problematic machines and the issue cleared up. The website has been launched and I will be sharing here tips, solutions, guides and general information about several topics in IT infrastructure. Feel free to checkout My Profile and connect with me.